Context: Finished this off as we packed up to head away for a holiday over Easter weekend. 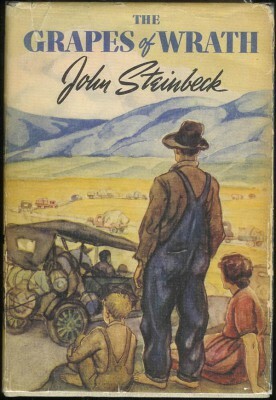 Steinbeck establishes himself, in my mind, as the USAnian Orwell with this novel chronicalling the desperate plight of the landless poor during the years of the Great Depression. From the word go, the language of the novel is poignantly melancholic, tinged with feeling as if the very words bore the weight of their suffering. It will live in my memory as one of my favourite novels. The book is haunting from start to finish. What I appreciated most of all were the little vignettes of life at the time that Steinbeck scatters between the narrative chapters. These are so memorable, they stand out almost as classics in their own right. There’s the turtle, the diner, the migrant camps. Each of these is beautifully crafted. I loved this book too . i just saw the movie, which was hoky, but that’s okay because it is old. There is so much about this book that pertains to today, economy the way it is – you know people are losing their homes right and left, especially in California, which is ironic as we are talking about people that moved out there 60 or 70 years ago. And the characters – Rosa Sharn, Tom Joad -aren’t too different from some of the people I meet here in southeastern USA all the time. I re-read this book again a couple months ago and yes, I do agree that it has a lot of points in it that are very much the way society has become today. The ending of this book was such a jaw-dropper to me. It was so touching to see the Joads help in such a selfless way to help out the starving family. God gave Rosa the power to help those around her even though she had to take a tremendous loss. Very touching indeed. I have only read the book once, but my wife Jill has read it twice. I loved it but have trouble reading the same book more then once. Society has change so much and it seems to be changing daily. I would like to see the movie. Has any one seen it and have any coments on it? Is it worth the watch? I’m 60 and read this book as a teenager and again 30 years later. Amazing how a second reading makes everything come to life in this book! I love this book. I too saw the movie and was not overly impressed. I have read the book twice. Once when I was twenty (35 years ago) and again a few months back when we visited a book store on the Oregon coast and found a copy of it there. The change in my perspective was refreshing and it was certainly good to read the book again at this time in my life.